The Selle SMP TRK lady saddle is designed from extensive studies conducted which analyzed the different positions assumed by a cyclist in the various phases of a ride and the constant interaction between the body and the saddle. Based on these findings, Selle SMP designed the STRIKE saddle which prevents the cyclist’s sensitive areas from getting squashed and increases the blood flow to the leg muscles. 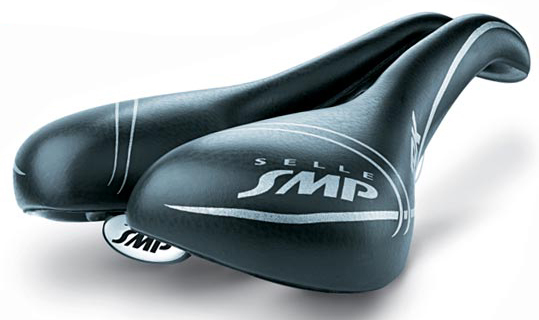 Selle SMP makes the saddle in Italy. The central channel of the saddle varies in width to contour the body and allow continuous circulation of blood flow. The front section of the saddle with its beak-shaped design offers excellent support when pedaling hard and prevents your sensitive area from getting squashed in the process. The design of the outer mid-section is shaped to follow your thigh muscles to maximize blood circulation and pedaling power. The overall weight of the rider is distributed throughout the saddle to offer comfort without sacrificing performance. This allows you to exert more power while in the saddle and ride longer more comfortably. The Selle SMP Strike TRK Lady features a women specific profile with a larger width platform for the proper support of a woman’s wider spaced hip bones. This design, along with more padding, allows for increased comfort. Frame: AISI 304 tubular steel rails.